Caxton Educational is visiting schools to help teachers view and trial their latest student and teacher maths resources. 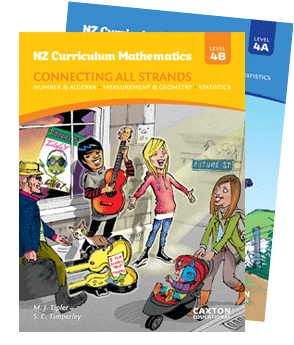 Just released in Feb 2014 - Level 4B Student Resource NZ Maths Book works in partnership with Level 4A (Student Books and Teachers Online Resources) and fully covers and connects all strands of the latest New Zealand Curriculum Mathematics. The demo's start at 4pm and are finished by 4.45pm. Email nigel@caxed.co.nz if you are interested in attending one of these coffee and cake events. 4pm, Wed 5th March 2014 - Baileys Road School. 4pm, Thurs 6th March, 2014 - Papatoetoe Intermediate School. If you are interested but unable to make it to any of these events, simply let us know (phone 0800 628 474 or email nigel@caxed.co.nz) and we will keep you posted when one is on in your area - or when a webinar event is available.